The move to Wednesday was seamless as the NXT Superstars once again delivered on the promised action. Each match kept the NXT Universe on the edge of its seat as we were treated to technical gems, highly anticipated all out brawls, and a rematch for the NXT Championship. This week’s installment of WWE‘s developmental brand was exactly what the doctor ordered for those of us trying to make it past Hump Day! Finn Balor and Tyson Kidd put on a clinic of technical professional wrestling. It was a beauty of a match that saw the Irish Demon take control as soon as the bell rang with a wicked drop kick to Kidd (minus Nattie *happy dance*). Balor continued to punish the Kitty Enthusiast with a combination of high speed kicks and brutal chops that forced Kidd to retreat to the outside. However, things were about to change as a miscalculation on the part of the high flying Irishman allowed Tyson to swing the offensive momentum in his favor. He slowed the pace down by keeping Finn grounded and was even able to lock in a Hart Dungeon classic, The Sharpshooter. Balor was able to claw his way to the ropes to break the hold and turn the tables on the Canadian. The match came to an end quickly after that as Finn Balor planted Tyson Kidd with a reverse underhook DDT that set Nattie’s husband up for a double foot stomp that led to Balor getting a huge pinfall victory. This match was intense and fun. At no point was I looking at anything else but the two men in the ring grappling, flying, and kicking each other around the mat. There was an intensity to the match that makes me want to see these two lock up again. Tyson does amazing work when there is no Natalya at ring side. His technical mat based offense coupled with Finn Balor’s flashier high risk skills made this match a must see for anyone who loves sports entertainment. It was filled with breath taking offense and comebacks that showcased each wrestlers’ abilities inside the squared circle. The NXT Universe was split down the middle over who to cheer for and finally ended up just chanting, “This is Awesome,” in their appreciation of how brilliant this match was. Tyson may have been pinned, but there were no losers in this first offering of the evening. Well the tag match I saw coming last week, manifested itself into reality this week, and it was as amazing as anyone could ever expect. Natalya and Becky began the match and it was another clinic in how to do pro wrestling right as Nattie and Lynch traded holds and countered maneuvers on after the other. The Queen of Harts finally began to get the upper hand and a frustrated Becky regrouped outside with Team B.A.E (Best At Everything) partner, Sasha Banks. The Women’s Champion and Natalya kept momentum in their favor by delivering a double baseball slide to their opponents and Nattie put her opponent back into the ring. This allowed a double suplex to be used on the Irish rocker as the NXT Women’s Champion was tagged in. When Sasha was finally tagged in shortly after the brutal suplex, she took it right to the other team, gaining offensive control when she delivered a double knee drop to Nattie’s midsection as she was tangled in the corner ropes. Charlotte caught the tag and began to punish the Boss landing hard chops and a neck breaker that almost ended the match if it weren’t for Lynch breaking the cover. The distraction of Becky being chased off allowed Banks to hit a neckbreaker of her own for the win over the NXT Women’s Champion and Natalya. This match was everything I could have hoped for an more. All four women were on top of their game and delivered a match that could have been a main event on any of the main roster shows. These ladies are revolutionizing what it should mean to be a female professional wrestler. Their intensity, aggression, technical prowess, presence, and what ever else you want to call it were at the same level or higher than their male counter parts. This is what I keep praying to the Wrestling Gods in their divine Squared Circle to give us in main roster Diva’s competition. I admit it, I’m spoiled, but at least I know that when I watch an NXT WOMEN’S match, I’m not going to be disappointed. It was the match we have been waiting for weeks and weeks. Finally the Bull and the Lone Wolf would lock up and we would see which of these two monsters would remain undefeated. As soon as the bell rang, it was an all out slug fest. Nothing pretty about it, but it was 100% brutal with teeth rattling blows that would have floored lesser men. The ring could not contain the ferocious pair as they battled to the outside and continued their war. Once back in the ring, some semblance of a match ensued as Dempsey used his massive frame to ground Corbin. Confident that he had the upper hand, The New York Nightmare went to end things with a flying headbutt from th top rope. However, Baron’s resilience as a competitor shown brilliantly as he was able to roll out of the way and gain the upper hand. A quick End of Days to a stunned Dempsey for the win, made Baron Corbin NXT’s most dominant monster! I FINALLY got my wish. Baron Corbin in a match that lasted longer than 30 seconds! Was it everything I’d hoped it would be? Not really but I did enjoy it all the same. There is something to be said for matches that you know will not be technical dreams but hard hitting slug fests. I have seen in other Matches that Baron is capable of actual wrestling maneuvers. And apparently Bull can keep from being rolled over. I definitely want to see these two go at it again simply because I feel teh match was simply too short. And when Bull looked to get some momentum going, he foolishly tried to end it instead of wearing his opponent down more to guarantee the flying headbutt would land its mark. Granted this could also be that he too is used to facing guys that don’t need that much punishment. When ever these two face off again, it will be more brutal. This really did feel like a first shots fired sorta thing in rivalry that is just getting started. The rematch the NXT Universe couldn’t wait to see began with respect and honor as each competitor spent the first part of the match countering the counters attempting to get one up on the other. It appeared that frustration began to wear on Neville as after one of the many exchanges he ended up pushing Sami away and then immediately apologized. Sami, feeling the same frustration, channeled it into a new offensive attempt but the Man that Gravity forgot ended up coming out on top and began to land move after move that kept the champion on the defensive. In the midst of his offensive flurry, Neville countered a Blue Thunderbomb with elbow after elbow to the back of the champions head. But once again, offensive momentum was fleeting as Sami was eventually able to land the move to pick up a near fall on the challenger. Neville refused to make anything easy for his friend as he shocked the NXT Universe and Zayn by landing on his feet after an attempted suplex and nearly pinned the champion after he planted Sami’s head to the mat with a swift hurricanrana. It looked to by lights out for the champ as he lay their limp causing concern from both Neville and the official. It turned out to be Sami using Adrian’s past tactics, as he attempted to lock in the Koji Clutch.The two continue their back and forth battle and it spills on to the floor. Sami when for the flying DDT threw the ropes but Adrian had it well scouted and countered with a huge kick that sent the champion reeling and primed for the former champion to attempt his Red Arrow finisher. Sadly for Adrian, he missed the high risk move and this allowed Sami the chance to hit him with an exploder suplex into the turn buckle which was followed up with the Helluva Kick for the pinfall victory and the first successful title defense of the NXT Championship for Sami Zayn. Just when we thought Sami Zayn would finally be able to celebrate a victory, Kevin Owens arrived on scene once again! He delivered another powerbomb to the champion and further staked his claim of dominance as he stood with his foot on his former friend’s throat. He left without further incident but we all know there is more to come. This match started slow but it built quickly after all the pleasantries were exhausted. It swiftly turned into the match we all wanted to see. Nothing against the slow start, but when you hear Sami Zayn vs Adrian Neville, a certain amount of speed is to be expected. Granted it showed us they can be more strict grapple minded and that they knew each other insanely well given all the counters of the counters. But when Adrian got pissed enough, then the match got interesting and business picked up. Then the rest of the match was on fire! Edge of the seat, screaming at the TV (I do that a lot with the REALLY good matches) and an ending that made the match a complete story. Where one story ends, another begins in the form of Kevin Owens. Oh how he makes my black little heel loving heart sing. The complete disrespect of both the title and Sami Zayn was a thing of beauty. It is yet another chapter to this budding rivalry that is sure to take NXT by storm. 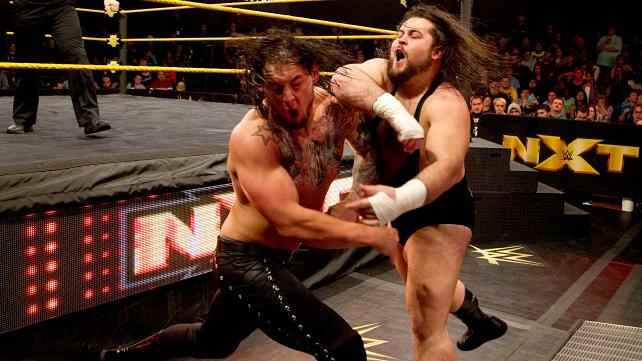 WWE: NXT 1/28/15 Recap!! Everyone Gets Upset!! This entry was posted on Thursday, January 15th, 2015 at 5:55 pm	and is filed under Events, News, Television. You can follow any responses to this entry through the RSS 2.0 feed. You can skip to the end and leave a response. Pinging is currently not allowed. « Syfy Producing Miniseries on Robert Charles Wilson’s ‘Spin’!! !